You’ve heard it before: working moms feel guilty they’re not spending enough time with their kids. 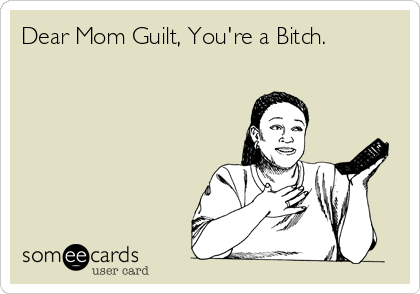 But did you know that stay at home moms share that guilt? And what about stay at home EXPECTANT moms? Yeah. 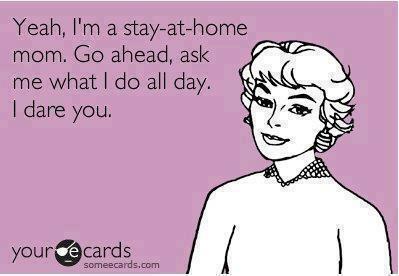 The guilt of a stay at home mom is pervasive. I finished a contract position, went on holiday, and came back pregnant. Parental leave in Canada can last for up to a year. By the time I was showing, I knew that no would-be employer would be willing to hire me only to have to find a replacement for me six months later. And you know what? I was okay with that. I was alright with taking some time to figure things out, do a little training on my own at home, some freelance work, and get ready to welcome this little person into our lives. It sounds wonderful, doesn’t it? It’s like being a woman is a black and white thing. You’re a mother or you’re not. You’re working or you’re not. You’re staying at home with the kids or you’re not. No matter what decision we make, we’re judged for it. We’re judged by society, by other women, and, most devastatingly, by ourselves. Those are the kinds of thoughts that enter my head some days. The days when my to-do list seems too long. Somehow I manage to spend hours doing something else entirely, and I ask myself how on earth I managed to get anything done while I was working. Then I remember the money my parents paid for my university education, and the money I invested in my master’s degree. Has that all been wasted? Why did I take an MA if it wasn’t to use it in a profession? What am I doing with my mind, my talents, and my time? So what am I doing? Am I just lazy? No. I’m not lying around all day eating bonbons (though, I have to confess, I have been baking a bit more since being unemployed…). When I’m on the verge of tears because I’m feeling like a total waste of space, it’s time to sit down and think about what I AM doing, rather than what I’m NOT doing. I am: Learning new skills like knitting and sewing. I am: Reading incredible books in three different languages. I am: Keeping up-to-date on current events, news in my industry, and listening, watching and reading news analysis from various media sources. I am: Making an effort to keep writing, no matter how sporadically, and keep that creative muscle in shape. It may not sound like much, and if I’m honest I’m still judging myself pretty harshly for being so seemingly idle (and for still hiring a cleaning lady). You gotta let go of the guilt. If I don’t let go of it now, it will eat me up when this baby arrives. Because if I feel unproductive now, just wait until all I have time to do is change diapers, feed, and devote all my attention to a tiny little person. You can bet we’ll be caught without any milk in the fridge on a regular basis when that happens. This image isn’t entirely relevant, but I loved it. No matter what decision you make when it comes to raising your children (or, in my case, making your children), the important thing is to make it freely and with understanding. Read about other women’s experiences and ask yourself how you would feel in their situations. Understand what you’re getting into, and then take steps to make sure that you continue to push yourself in ways, no matter how small, that will keep your body and your mind open and in shape. And when people raise their eyebrows after you’ve answered the “What do you do?” question? Well, what can I say? 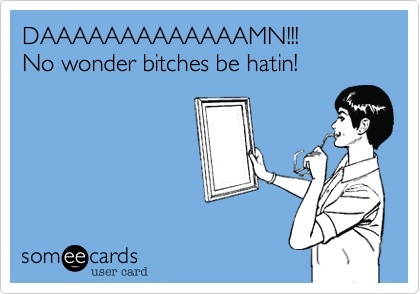 Haters gonna hate. Own it. And tell yourself that in some, small way, they’re probably jealous of you. Give yourself an intellectual challenge. The pitfall about staying at home is the lethargy and inactivity you can slip into (unless, of course, you are an exceptionally motivated person). Keep yourself engaged. Keep writing, keep reading, keep listening and searching. Go out and meet people, or learn something new. Whatever it is, do it to ward off the guilt. Because our children, especially our daughters, need to grow up free from the unreasonable expectations of perfection that society puts on us that cause this guilt. And most of all because all any of us can really do is our best.